José Mourinho thinks he deserves credit for Chelsea’s success this season. You can tell that this is true because he has said the exact opposite. 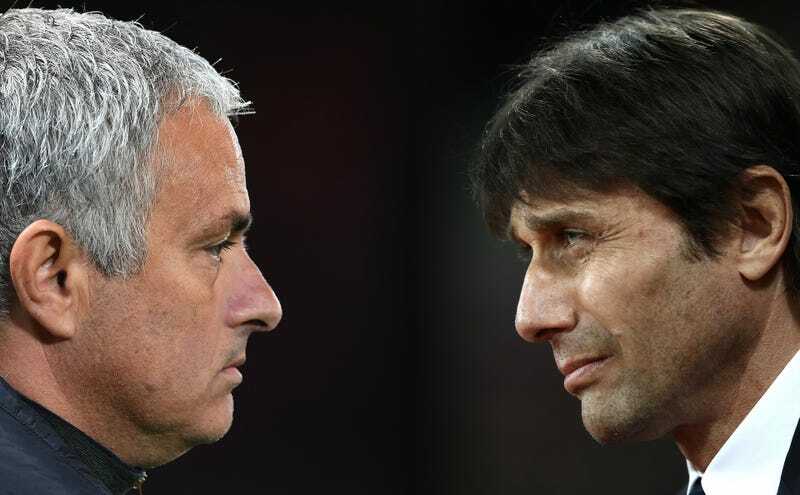 “I am not asking for any credit, I am not asking for that,” is what the Special One told reporters yesterday in reference to his old club Chelsea’s great campaign in their first full season after the disaster Mourinho oversaw before getting fired last year. Mourinho’s new club, Manchester United, are set to face Chelsea in the F.A. Cup today. And Mourinho apparently wants no mistaking that even when he did poorly at Chelsea, he still did good. Last season, Mourinho was fired from Chelsea mid-season in the midst of an absolute catastrophe. Chelsea entered the season as reigning Premier League champions and favorites to repeat the feat. By December, with the club wallowing near the relegation places and Mourinho casting blame in every direction except his own during a series of increasingly bizarre post-match pressers, Chelsea finally gave up on their most successful manager ever and sacked him. The Blues wound up finishing 10th under the leadership of interim manager Guus Hiddink, and moved on in the summer by hiring Antonio Conte. With almost the exact same group of players as before, Conte has Chelsea thriving. They are near-certain locks to win the Premier League and now find themselves in a big F.A. Cup quarterfinal against Man United. “The most difficult thing to have is time to work, and they have time to work,’’ Mourinho said when asked how hard it is to win the league in your first season. “I know that he said a couple of days ago or a couple of weeks ago that it’s not his fault that they are not in the European competitions. “It’s my fault and the players’ fault, but the reality is that he got in his hands a situation where they have time to work, time to rest, time to relax, time to disconnect, time to travel, time to have holidays, time to go to America and enjoy America for a couple of days. Thing is, Mourinho is right. Not playing in Europe really is a huge boost, and it’s easy to imagine that this Chelsea team wouldn’t be doing quite as well if they had all those extra mid-week games out in Russia and Ukraine the way United have. The strange part is how he seems to want these benefits that accrued from last season’s failure to be attributed back to him. “They choose a certain style of play that I think is very adapted to the qualities of these players. “They defend a lot and well, and they counter-attack and kill opponents on the counter-attack similar to my Chelsea. “I am not asking for any credit, I am not asking for that,” is how Mourinho wrapped up this line of dialogue. He went on to explain that he would treat the Chelsea match the same as any other, the match holding no particularly special appeal to him. “Am I sadder to lose against Chelsea than against another team? No. Am I happier to win against Chelsea than another team? No,” he said. Informed by how his prior statements seem to mean precisely the opposite of his words’ literal meaning, it’s probably a safe bet that Mourinho would love nothing more than to get one over on the club whose good fortunes remain, in his mind, so indebted to his own great work.